650 and 700 are French wheel and tire names. They are approximatly equal to the metric diameter of the tire. As you can see, all 650 size wheels have about the same outside diameter. As the rim diameter, gets smaller the tire gets fatter. This allows one to change wheel size on the same bike. Sometimes you need to change brake calipers, but often not! 650B (584mm; 26 x 1 1/2") wheels and tires have recently become all the fashion. This is partly due to their utility for country or urban bike riding. However, the primary reason is due to Grant Peterson and Jan Heine's promotion of the size on Rivbike.com and in Bicycle Quarterly, respectively. Indeed, both men had to source tires from other countries because they simply were not available in the USA. Grant paid for new tire molds and commissioned Panaracer to make the first modern 650B tires. Japanese bike enthusiasts, being Francophiles, love the 650B size because it is French. The growing popularity of Randoneering in the USA has made 650B popular within their niche. Prior to this renaissance, 650B was primarily only seen in France or on rare bikes brought over here. 650A is 100 times more common, world-wide than 650B. 650A is common in Japan, the USA and England. It is often used as the wheel size for smaller people. For example: in Japan, 650A is still the men's utility/city bike wheel size while the women use 540mm (24 x 1 3/8"). Prior to the late 1990s reintroduction of the 650B size there were few bikes marketed in the USA with 650B wheels. The 650 range is the perfect combination of tire width and weight for long distances over varied surfaces (and now it is the new mountian bike size as well, see below). While we support the use of 650B for general everyday cycling, we wish that Jan and Grant would have studied their history a little better. If they had, they would have discovered that a near identical size (indeed 3 other sizes) were already widely used! The nearly identical size 650A (a.k.a. 26 x 1 3/8; 26 x 1 5/8"; 590mm) is still widely used and available from most manufactuers. 650A (590mm) rims are 3mm in radius larger than 650B (584mm). It is nearly impossible to build a bike for one size without it being compatible with the other! However, most 650B tires are too fat for most 650A bikes. If you could time travel back to the late 1980s you would witness the bicycle industry discontinue the production of bicycles with 27" (630mm) wheels in favor of the nearly identical size 700C (622mm). In fact, both sizes use the same inner tube. They are that close. 650A and 650B are even closer! 650B has been tried and abandoned for the US market several times in the past. The Raleigh Portage was one example. There was ONE tire available for that bike. There was ONE - [period] 650B tire available at bike shops at the time. It is worth noting, again, that every major tire manufactuer makes 650A tires. 650A wheels came on many smaller 10-speed kids bikes and the ubiquitous Raleigh 3 speed. Most bike shops stock 650A (26 x 1 3/8") tires and tubes! Just like 27" vs. 700C- the tubes are the same, but now 650B tubes come in presta valve and 650A tubes are schrader. They are interchangeable if you drill out the rim. Our point is: Why have two nearly identical size wheels and tires that serve the same purpose? The answer is marketing! Now the mountain bike industry has locked sights on the 650B tire as the perfect size. This size is nothing new and was tried by GT Bicycles in the 1990s with their 700D (587mm) mountain bike. The truth is tire width and tire pressure trump all! If you ride a tire wider than 32mm you will be able to ride most places. 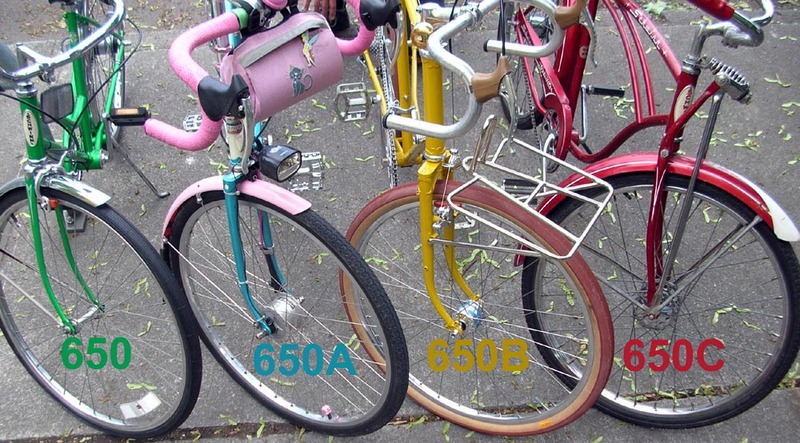 A final note about 650A vs. 650B is that most quality road bikes can easily accept 650A wheels and tires. Most 650B tires are too fat for the frames. Here is a nice Waterford road racing bike we upgraded to 650A. Here is Litespeed road racing bike we upgraded to 650A. Note that 650B tires are usually too fat for most road bikes. 650A tires come in widths from 26 x 1 1/4" to 1 5/8". Most road racing bikes use 700C x 23/25mm tires (approx. 685-690mm). Converting to a road bike to 650 also gives ample clearance for fenders! *650C is also commonly used on triathlon bikes however the tires and rims are much narrower. 700C also used to be a fat tire size and is again with the advent of 29er bikes.